With World Wide Web is evolving faster than ever. We've seen recent developments in Virtual Reality and it's path to the web. And with tools that is available to use, it's getting easier and easier to build Virtual Reality experiences. It's Christmas time again and growing up I've always seen these Christmas Snow Globe. It's so peaceful to see how snow falls down slowly. Growing up in country where there's now snow, it's fun to see the christmas snow globe. What if we can experience being inside the snow globe. What would it be like? What if I have a snow globe, connect it to my VR device and get transported inside a snow globe. I built a proof of concept device that I think would start an industry of VR connected devices. Vive is a first-of-its-kind virtual reality system. Let yourself be visually, physically and emotionally amazed by new virtual worlds. I have one and it's amazing. You can move around and have controllers that is used to interact with virtual world. If you haven't tried an HTC Vive, visit a Microsoft Store near you. According to https://aframe.io/ : "A-Frame is a web framework for building virtual reality experiences. It was started by Mozilla VR to make WebVR content creation easier, faster, and more accessible. I recently found out that A-frame supports HTC Vive using this Chrome experimental build. So I downloaded this to my computer and followed the instructions to setup. Inside the Vive, you can actually see your controllers, grab box or paint. I'm hooked. Time to learn what I can do with these technology. It's a Virtual Reality Snow man with Snow particle system. Then I looked around and found another project where you can throw a ball inside Vive with a physics system. I asked myself: What if it's inside an Arduino? Can it be done? I recently found out that you can host your website inside the arduino? Can a Virtual Reality website hosted too? How I made the Snow Globe VR! Arduino MKR1000 has been designed to offer a practical and cost effective solution for makers seeking to add Wi-Fi connectivity to their projects with minimal previous experience in networking. I added an accelerometer, I used the one that comes with Grove starter kit for Intel Edison. It's based on Freescale's MMA7660FC chip. Followed the instructions on how to create a WebServer and install the driver for Digital Accelerometer. If I go to http://<arduino-ip-address>/VR it will server the VR website. 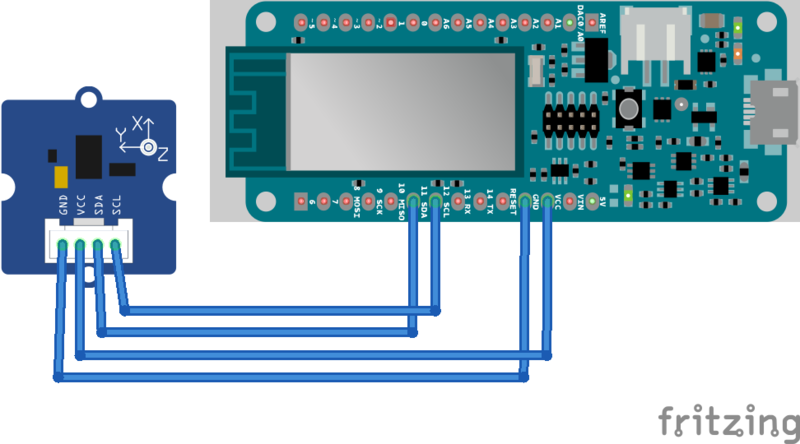 If it's just the http://<arduino-ip-address>/ it will return data from accelerometer. Got the webvr site working, but now how do I send accelerometer data from arduino the browser? I thought of different strategies like sending data thru a cloud, or do websockets, mqtt. I thought to myself, simplify the process. Don't overcomplicate stuff. I'm only serving 1 user, no need to do cloud. Think small not big. No big data. How about polling? The classic polling method. Why not? It's only limited to 1 client, it's not serving multiple users (although it can). I can just instruct my web client to ask the arduino webserver to return the accelerometer data every 2 seconds. It doesn't have to be realtime. Having snow in WebVR using the aframe particle system works. But only small amount of snow. I want more? So I tinkered with settings on particle system. I got stuck. I've changed variables and it seems to make it worse. So here's what I did. I found out you can manipulate the DOM in A-frame. So you can add entities dynamically. I tried manipulating the DOM first, adding and removing particle systems, but it slows down the site. It actually crashes the browser. So disabling the emitters and enabling the emitters is the best way to go. Every 2 seconds, it will start to disable emitters. When the snow globe is tilted, it will enable all the emitters again. I want to expand this project to make it easy just to tap your phone to the snow globe and BOOM - get transported to VR world. I think it can be accomplished. My daughter likes to the song 'Let it go' from Frozen. What if she can use the HTC Vive to build Ice Castle or build Olaf. Thanks to Mary Knize and Ben Pyrik.